An experimental system on a Stryker destroyed a drone without firing a bullet or making a sound, the Army reports. 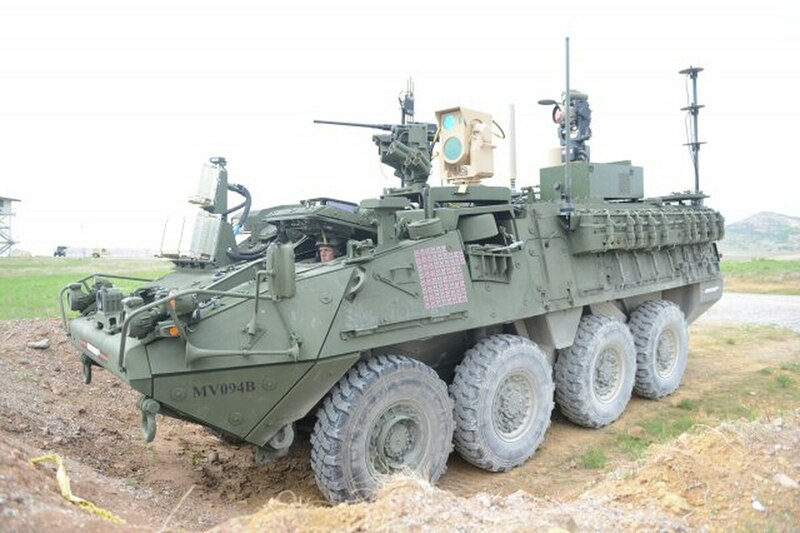 The Mobile High-Energy Laser is one of the systems the Army tested at the Maneuver Fires Integrated Experiment at Fort Sill, Oklahoma, April 3-13. Capt. Theo Kleinsorge said called the system valuable, and sees more uses for directed energy, "to destroy incoming anti-tank missiles, mortars, field artillery rounds," he said in an Army report. Kleinsorge, commander of Headquarters and Headquarters Company, 2-12 Cavalry, at Fort Hood, Texas, came to see if the system, called MEHEL, could be handled by a forward-observer crew, or if others should use it instead. His team took down around 50 targets, even though none of the soldiers had used directed energy before. He said the soldiers are "excited" to see what can be done with the system. The system was easy to use and learn, and takes about a half hour to figure out, according to Spc. Brandon Sallaway, a fire support specialist and forward observer from Fort Carson, Colorado. "It uses stuff, controllers, that we're all familiar with," he said. This project was originally presented last year with a 2kW laser, but the MEHEL 2.0 is fixed with a 5kW laser capable of both a hard kill, using the laser, and soft kill, in which communications are cut between the drone and its ground control station, according to the report. The MEHEL does not require ammunition, only fuel, and the batteries that are used to fire the laser can be recharged from generators powered by the same fuel the Stryker uses. "If the entire Army today adopted directed energy and it was able to solve all of our engagement problems, Class V ammunition would no longer exist, and Class III, our fuel, would now be essentially our only logistical requirement for the vehicle to be offensive," Kleinsorge said in the report. The system was one of three anti-drone systems at MFIX this year. The exercise had several goals this year, such as improving ways to pinpoint targets, looking at whether traditional supporting soldiers can execute a counter-unmanned aircraft system mission while also conducting traditional artillery missions, and new ways to deliver supplies using unmanned aerial systems. Rachael Kalinyak is an editorial intern with Network Solutions.